 Does India respect its fallen war heroes? The state chief minister himself has been an ardent advocate for clemency for the terrorist who attacked the Indian Parliament in December 2001 (and nearly provoked a war between India and Pakistan). The 'secular' protagonists claim that his execution will make a martyr of Afzal. I will not enter into these fallacious arguments, but the time has perhaps come to remember a true martyr: Major Somnath Sharma who on November 3, 1947 saved Srinagar airport (and Kashmir) at the supreme cost of his life. Had he not sacrificed his life, Afzal's defenders would not today make front page news in the Indian press, for the simple reason that they would be Pakistani citizens living under a military dictatorship. Our story starts during in the early days of October 1947 when Prime Minister Jawaharlal Nehru received a message from a former deputy commissioner of Dera Ismail Khan [one of the province's main districts] in the North West Frontier Province. As Maharaja Hari Singh of Kashmir was reluctant to sign the Instrument of Accession to India, Nehru refused to take any action. Two weeks later a large contingent of Afridis, Mahsuds, Wazirs, Swathis and regular soldiers of the Pakistan army 'in mufti' began to enter Kashmir. During the night of October 22, the 'raiders' burnt the town of Muzaffarabad. They then overran Uri and captured Mahura, the electric power station, fifty miles from Srinagar. The city of Srinagar was plunged in darkness. In these dramatic circumstances, V P Menon, Sardar Patel's faithful collaborator, went to Jammu and got Hari Singh's signature on the printed Accession Form. He rushed back for the historic meeting in Delhi with India's governor general, Lord Mountbatten in the chair. Everything then moved very fast. Early the next morning, the first troops and equipment were airlifted from Palam airport [in Delhi] to Srinagar. A young major was sent on his first assignment to Kashmir. He was responsible for the logistic. His name was S K Sinha (today the governor of Jammu and Kashmir). They knew that all eyes in India were focused on them. At Srinagar airfield, just before returning to Delhi, Sinha met an old friend, Major Somnath Sharma of 4 Kumaon. He had come a day earlier from Delhi with a broken arm. His company had now been posted to Kashmir, but he was looking to be relieved soon from his present job and given 'something really active.' His company's duty was 'only' to protect the airport. But let us spend a moment on Somnath Sharma's life. He was born as the eldest son of an army family. His father General A N Sharma, who retired as the first director general of the Armed Medical Services after Independence, was often in non-family postings. Som, as his friends and family called him, used to spend time with his maternal grandfather Pandit Daulat Ram in Srinagar. His favourite pastime was listening to his grandfather's on the Bhagavad Gita. This influence of Krishna's teachings to Arjun were to remain with Somnath till his last breath. At the age of 10, Som enrolled at the Prince of Wales Royal Military College in Dehra Dun and later joined the Royal Indian Military Academy. As a young lieutenant, he chose to join the 8/19 Hyderabad Infantry Regiment. His maternal uncle Captain Krishna Dutt Vasudeva who belonged to this regiment had died defending a bridge on the River Slim in Malaya against the Japanese. His bravery had made it possible for hundreds of his jawans to cross over to safety. The example of his uncle greatly influenced him during his career. Somnath retorted, 'Sir, it is my own orderly that I am carrying; he is badly wounded and bleeding, l will not leave him behind.' He eventually managed to carry Bahadur back, saving his life. He was awarded a 'Mention in Dispatch' for this act of bravery. After the Japanese surrender in Kuala Lumpur in September 1945, Somnath returned from Malaya via Calcutta. Before landing, a small incident occurred when the British Military Police came aboard to check for contraband. Som had an unauthorised pistol unofficially presented to him by some Japanese officer in addition to a Samurai sword (officially allotted to each officer). Somnath refused to lie or invent a story to bluff the British officer, he immediately threw the pistol into the sea through a porthole. Such was his straightforwardness! Two years later, India became independent, but fell prey to mad communal fighting. With his Kumaonis, Somnath was dispatched to aid the civil administration. From his headquarters at Parliament Street police station, he spent his time extinguishing fires between the two communities -- both well armed. To complicate the matter, streams of refugees were pouring in wave after wave to the capital. The Kumaon Regiment rose to the occasion, doing their duty honestly and impartially towards both communities. At that time, Somnath was moving around with his broken arm and a plaster from the wrist to the elbow. When his company was ordered to move to Srinagar, Somnath, though technically 'unfit for active duty in war' insisted that he had to lead his company. Before leaving for Srinagar, he spent his last night in Delhi with Major K K Tewari, his best friend and Burma companion, at the Queen Victoria Road bachelor Officers' Mess in Delhi. They chatted late into the night. Somnath remarked at one point that he was going to war again but alone this time (without his friend). Having probably some premonition, he asked for a memento from Tewari who told him that he could take whatever he wanted from the room. Somnath went straight to the cupboard and took his automatic pistol, a German Luger. Quite upset, Tewari had no choice but to honour his promise. The next morning Somnath Sharma landed in Srinagar (where he met S K Sinha). The situation was fast deteriorating. 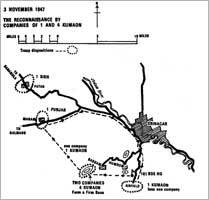 Two days later on November 3, the 'raiders' reached Badgam a few miles away from the Srinagar airfield. Brigadier 'Bogey' Sen, the commander in Srinagar, immediately dispatched Sharma and his company to Badgam. At 2:30 pm, supported by 3-inch and 2-inch mortars, a 700-strong tribal force attacked the Indian jawans. Being outnumbered by 7 to 1, Sharma immediately sent a request to Brigadier Sen for reinforcements. He knew that if the enemy advanced any further, the airport would be lost and Kashmir would become a province of Pakistan; the airfield was the only lifeline between the Valley and the rest of India. Soon after, Somnath Sharma was killed by a mortar. Does India respect its fallen heroes? By the evening, when reinforcement reached Badgam; it was too late. The Kumaonis had suffered over 50 per cent casualties though they had inflicted much heavier losses to the 'raiders' who lost 200 men and the airport and Kashmir. Major Somnath Sharma was awarded the first Param Vir Chakra, the highest Indian gallantry award (the Indian equivalent of the Victoria Cross). Three days later, Sharma's body was recovered. Though mutilated beyond recognition, a few pages of the Gita that he always kept in his breast pocket and the empty leather holster of Tewari's pistol helped to identify the body. The pistol was gone. Sub: The valiant never taste of death but once!! Sub: WE DO NOT DESERVE SOLDIERS LIKE HIM.